تحلیل حرکتی سامانه گسلی کوشک نصرت در ناحیه شمال ساوه نشان می‌دهد که سازوکار این گسل (با راستای WNW-ESE)، در زمانی پس از میوسن زیرین، از راستالغز- مورب‌لغز معکوس راست‌بر به مورب‌لغز معکوس چپ‌بر (در برخی پهنه‌ها تا راستالغز چپ‌بر) تغییر کرده است. شواهد ساختاری بازمانده از حرکت راست‌بر گسل عبارتند از: 1) حوضه کششی کوشک نصرت که در نتیجه خمیدگی راست پله مسیر گسل در شمال ساوه توسعه یافته و در داخل آن توالی نازکی از سازند قم نهشته شده است. 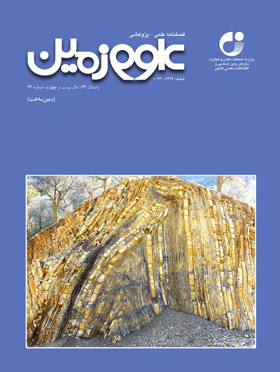 2) باندهای برشی و نشانگرهای حرکتی فعالیت راستالغز- مورب‌لغز معکوس راست‌بر که در پهنه اصلی گسل یافت شده‌اند. 3) گسل‌های همسو با سازوکار راستالغز راست‌بر و ناهمسو با سازوکار راستالغز چپ‌بر که در پهنه تخریب دیواره‌ای گسل اصلی یافت شده‌اند. پس از وارونگی جهت بردار لغزش در گسل کوشک نصرت: در محل خمش، مجموعه‌ای از گسل‌های مورب‌لغز معکوس چپ‌بر، راندگی‌ها، گسل‌های راستالغز چپ‌بر و چین‌خوردگی‌های کوچک مقیاس توسعه یافته‌اند. سازوکار جوان گسل کوشک نصرت شاهدی دیگر بر نقش اساسی گسل های معکوس دارای مؤلفه راستالغزی چپ‌بر در دگرریختی جوان بخش شمال باختری بلوک ایران مرکزی (در ناحیه قم- ساوه) است. موضوعی که پیش از این، توسط شواهد ساختاری و ریخت‌زمین‌ساختی در مورد گسل‌هایی چون ایپک (در جنوب بوئین زهرا) و البرز (در شمال قم) و شواهد لرزه‌ای از تحلیل سازوکار کانونی زمین لرزه بوئین زهرا گزارش شده است. The kinematic analysis of the Koushk-e-Nosrat Fault (striking WNW-ESE) at north Saveh city indicates that since a time after early Miocene it has been inverted from dextral strike-slip (and reverse-dextral-oblique slip) to reverse-sinistral (and sinistral strike-slip( displacement. The Kinematic evidences of right-lateral strike-slip displacement are: 1) Generation of the Koushk-e-Nosrat pull-apart basin along the bended segment of the fault in north Saveh city where a thin sequence of the Qom Formation (late- Oligocene to early Miocene) has been deposited in this narrow basin. 2) Shear bands and other kinematic indicators of right-lateral strike-slip and reverse-dextral-oblique slip displacements exist in the fault zone. 3) Synthetic right-lateral and antithetic left-lateral strike-slip faults are observed in wall damage zones around the main fault zone. The evidences of left-lateral strike-slip displacements after slip sense inversion are: sinistral- reverse faults, pure reverse faults, sinistral strike-slip faults and folds are generated in the Koushk-e-Nosrat Fault zone. The younger left-lateral reverse kinematic of the Koushk-e-Nosrat Fault is another significant evidence for the main role of the left-lateral reverse faults in deformation of the Qom-Saveh district in NW part of the Central Iran Block that has been tested before by structural and morphological kinematics of other major faults in the area like the Ipak (south Boin-zahrah) and Alborz (north Qom) Faults and seismological evidence of earthquake in the Boin-zahra areas.